Research on Arabic media reveals Qatar is taking a more active role in fomenting tension within Israel using an unusual weapon - soccer. A new research article citing Arabic media sources reveals that Qatar is backing Jibril Rajoub, who was behind the recent failed Palestinian Authority (PA) effort to ban Israel at FIFA, as a replacement for Mahmoud Abbas as PA chairman when - and if - he steps down. Pinhas Inbar made the revelation on Tuesday in an in-depth article on the Jerusalem Center for Public Affairs website. The Center is a research institute headed by Dr. Dore Gold, former Israeli Ambassador to the UN. Abbas has remained in office despite the fact that his term ended in January 2009, but nonetheless Qatar evidently has thrown its weight behind Rajoub, who holds the post of PA football association president and has been outspoken in his call for violence against Israel. Back in 2013, Rajoub said "I swear that if we had a nuke, we'd have used it this very morning," in an interview with Arabic media. Inbari exposed that while Qatar supports Rajoub, Saudi Arabia and the United Arab Emirates have put their backing behind Mohammed Dahlan, the arch-rival of Abbas who was ousted and fled to Dubai in 2012. After the 1993 Oslo Accords, Dahlan was the PA security chief in Gaza, while Rajoub was the security chief in Judea and Samaria. In-light Press, a website associated with Dahlan, has attacked Rajoub for backing former FIFA President Sepp Blatter for re-election before he stepped down amid a corruption case instead of the Jordanian candidate opposing him, according to Inbar. Jordan is reportedly threatening to revoke Rajoub's Jordanian citizenship over the move. According to Inbar, Qatar's interest in the PA leadership is part of a plan to create instability in Israel through a very unconventional weapon - soccer. 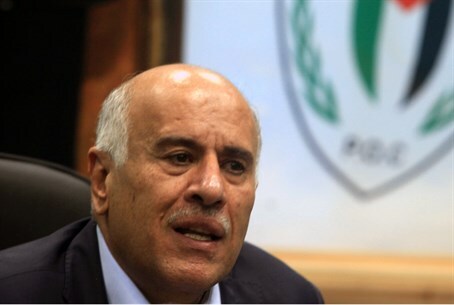 Rajoub has said that as PA chairman he will demand four soccer teams from "1948," namely from the Israeli league, be included in the Palestinian Football Association, calling to ally Arab citizens of Israel with the PA and sow division among Israel's Arab population. Along those lines, he has drafted Israeli Arab players to the PA league and national team. Rajoub may also be planning to allow Hamas personnel to freely enter Judea and Samaria according to Inbar, who notes that Rajoub's unofficial deputy in Gaza according to Palestinian Arab sources is Abd al-Salam Haniyeh, the 19-year-old son of Hamas leader Ismail Haniyeh. Soccer in Gaza is under the jurisdiction of Hamas, meaning Rajoub may push for Hamas to enter Judea and Samaria under the auspices of soccer. "Qatar’s backing of Rajoub as Abbas’s successor, then, points to a real possibility that Rajoub will allow Hamas to infiltrate the West Bank," wrote Inbar, adding that while Rajoub in the past cracked down on Hamas a reconciliation likely was reached with Qatari intervention. The research also quoted Arab sources in Ramallah, who revealed that Qatar has seen a shift since the new Qatari emir Sheikh Tamim bin Hamad Al Thani took power. Under his control former Arab MK Azmi Bishara, who fled treason charges in Israel after guiding Hezbollah rockets, along with Hamas politburo chief Khaled Mashal, have not only been given refuge but have been granted privileged status and aid in attacking Israel from afar. Qatar backs several Israeli Arab soccer teams, including Bnei Sakhnin as well as Ahi Nazareth, whose uniforms are green in the color of the Muslim Brotherhood and read "Thank you Qatar." According to Inbar, "the volatility of the soccer fans’ passions could indeed cause a deterioration of Jewish-Arab relations and make the soccer teams under Qatar’s sponsorship a hub of friction and provocation" for the Arab Israeli population. He noted that not long after Tamim took power, Qatar-aided teams were required to hold ceremonies in honor of Bishara, events that led to great tension and division as Qatar apparently intended.